Broaden your culinary repertoire with the Euro-Chef Electric Deep Fryers. Made of commercial-grade stainless steel, these kitchen appliances are the ideal frying companions especially when you want to achieve new, exciting and delicious dishes. Safe, effective and easy to use, you can now enjoy perfectly deep fried dishes like fish, chicken, spring rolls, onion rings and chips. Equipped with heavy-duty and powerful heaters, the Euro-Chef Electric Deep Fryers can have you cooking like a pro. 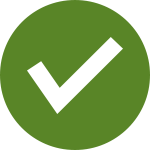 The fast heat up and recovery time is amazing, and so are other fine features such as the heat conductor which is designed to produce even heating. They also have a power-saving automatic thermostat, individual timer dials and individual temperature settings ranging from 60-200°C. 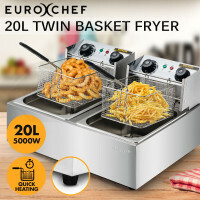 Available in 10L and 20L capacities, you can never go wrong with the Euro-Chef Electric Deep Fryers. The high quality materials and robust construction guarantee a long service life and consistent performance. Cleaning up is also not an issue, thanks to special features such as the hinged removable oil-heating plates and food baskets with handles. The non-slip rubber feet ensure that the fryers stay in place while you cook your favourite dishes. The Euro-Chef Electric Deep Fryers are not just limited to home use such as preparing food for family dinners and entertaining guests. They are also perfect for commercial functions like in restaurants, snack bars, fast food stands, food courts and supermarkets. Mytopia is also home to other dependable appliances which can make life much easier around the kitchen. Be sure to check out other impressive products such as Electric Air Fryers, Soup Makers & Blenders, Slow Cookers and Food Dehydrators. Also available are Popcorn Machines, Ice Makers, Food Waste Disposers as well as Meat Grinders & Slicers. Enjoy perfectly delicious cooked fried food anytime, anywhere. Purchase a Euro-Chef Electric Deep Fryer today!